Twitter is sending out emails to 250,000 users of the service that may have had their accounts compromised this week to change their passwords. 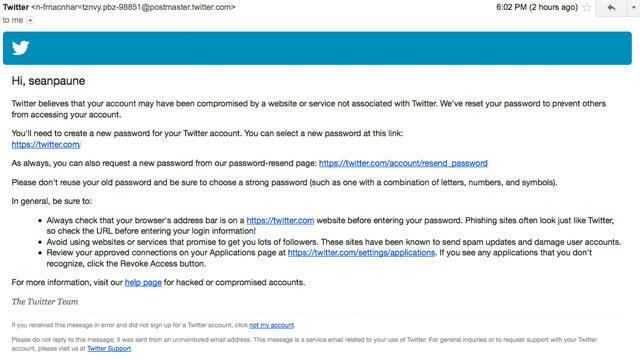 If you're a user of Twitter and receive an email similar to the one you see above – as I did earlier this evening – congratulations, your account may be one of the 250,000 that were potentially compromised this week. In a blog post on the company's site this evening the situation was explained as clearly as it could be. Twitter explained that it decided to be very public about this situation as it believes this was the work of a sophisticated group and that this isn't the only attack that it has been orchestrated against companies as of late. Should you be unfortunate enough to receive one of these emails, make sure to change your password immediately.